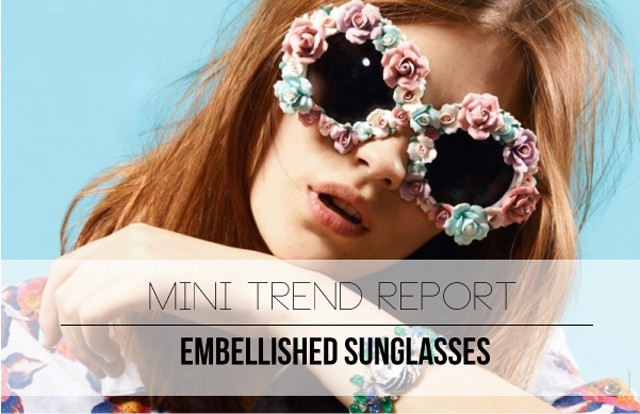 Inspired by all the style at Coachella this past weekend I've decided to feature the growing trend of embellished sunnies. Some are pretty out there yes but with outdoor music festivals on the horizon it's the perfect place to be experimenting with them! Summertime is a playful time of year and when it comes to kicking back at the cottage or hanging out on the beach we change into our casual attire but being girls we still like to keep it "cute". So if it's wearing floral print, floral crowns or floral sunglasses there is no way you won't look adorable and be a great complement to the sunny summer season. If you're into this trend you can find a few options below on where to get your hands on them. OR if you're into taking on a good art and craft then this one is such an easy and fun one to do!! 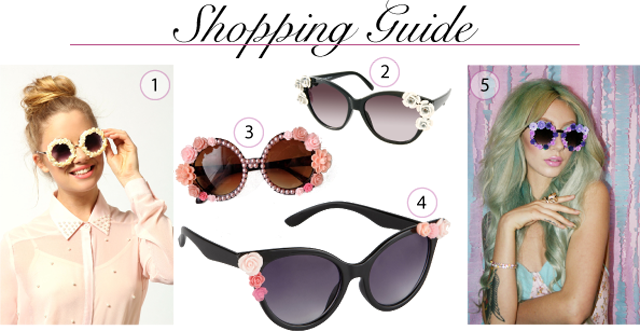 Making your own floral embellished sunglasses is totally worth it because you have the control of first selecting a pair of sunglasses that best suits your face and that's not always an easy task in my opinion. You also have the control of what you are decorating the sunglasses with. It's up to you to choose the colours, placement, type of flowers or even add in other non-floral bits like jewels and pearls! To get steps on how to make your own embellished sunnies check out Emily's DIY over at Cupcakes and Cashmere by clicking here. If you've made your own I would love to see them! Nicee! Love the heart ones! these are so cute, i definitely think i'll be getting my creative side out this weekend! Perfect spring trend and so cute for anyone that wants to rock it! personal style and fashion musings of an LA fashion lawyer living life in the fab lane!" Been seeing these everywhere! Great post!